For the past 2 weeks, I've been actively following the London Olympics while searching for jobs. As a result, my biological clock as gone wonky due to the 8 hours difference. Anyways, this Olympic Games sure is an interesting one - world records broken, scandals involving doping & match fixing, etc. Eighteen badminton players were disqualified for match fixing & was reportedly suspended from the sport for 2 years. Our Malaysian athletes managed to garner 2 medals - silver & bronze medal for Datuk Lee Chong Wei & Pandelela Rinong respectively. Datuk Lee did put up a good fight with his nemesis, Lin Dan to try clinch the gold medal but however still could not defeat the unbeatable, defending Olympic champion. Still, a silver medal is better than no medal; Datuk Lee made the country proud. Pandelela's bronze medal in the women's 10m platform diving event was a surprise win as competition was stiff. She made every Malaysian proud of her & crafted her name in history by being the nation's first female athlete to win a medal at the Olympics. Congratulations to the both of them for all their efforts to leave an impression in the world arena! Nevertheless, all good things do come to an end. The 17-day event closed big bang finale which as quoted in Yahoo! Sports - the "symphony" of local flavours. 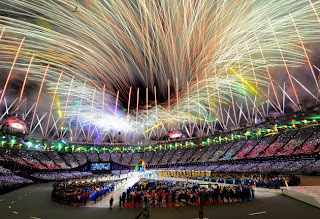 Pyrotechnic firework displays lit up the London sky during the closing ceremony featuring several British stars - old & new. Just to name a few of them who performed include One Direction, Annie Lennox, George Michael, Jessie J, Taio Cruz, Spice Girls & more. Even supermodels Kate Moss & Naomi Campbell made an appearance strutting their stuff on the stage at the centre of the stadium.